Nile Rodgers has broken the news that Adam will be performing on August 19, 2013 at his AFTEE’s Nile Rodgers Dance Party-East End. Tickets are available, starting at $149 for the Martha Clara Vineyards event. You can get tickets and information here. The event will feature many top artists in addition to Adam. Chic, AVICII, Chromeo, Mystery Skulls and comedian Russel Peters are also set to perform, along with an un-named special guest. Could this be DaftPunk, as Nile possibly let slip in the video below? AVICII is the electronic DJ of the moment who Adam and Nile just collaborated with for the unreleased dance smash, Lay Me Down. AVICII has been pumping this to close out his shows with. This is a good indication that it’s a hit-in-the-making. Nile was on Fox’s Good Day New York, speaking about the event. If you tune in, you’ll get the sense of how excited he is to have Adam there. Adam Lambert has formed some incredibly strong relationships with very solid people in the music industry. From his musical collaborations with producers like Rob Cavallo, Greg Wells and Linda Perry to icons Brian May and Roger Taylor of Queen. 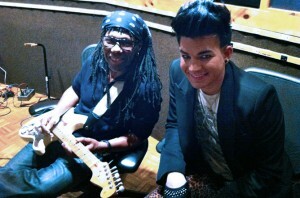 When Adam started working with Nile Rodgers on Trespassing, we didn’t know this would be a continuing relationship. I think this is just the beginning of a very long and satisfying ride! I love this collaboration and I am praying that Lay Me Down will be a song heard on the radio. Adam needs this so badly. Looking forward to Glee in the worst way.